that you’ve arrived at The Way Inn. With the thick stone walls, barred windows, the sturdy iron gate, the inn looked like a fortified outpost ready to with stand an invading army; yet the gate stood open, and the sounds of music and merriment within was warm and welcoming. There’s a tall barn on the east side of the property that’s connected to the tavern by a low wooden fence. The space between the two buildings forms an open yard that is rutted with the tracks of wagon wheels and marked by the prints of horses. Most of these lead to the double doors on the side of the barn. A short dirt track leads from the gates to the barn, while a second track leads up to the tavern. The tavern has a long porch in front with some benches and chairs on it. A second short fence connects the barn to the tavern in back. Through the gap between the buildings you see a second yard, some outbuildings, and a well. The front half of the barn is an open space large enough to house at least two wagons. There are shelves and worktables against the walls, a pile of crates in one corner, and a short pyramid of hay bales. The barn appears to be well stocked in supplies and also serves as a general goods store for the surrounding countryside. The room smells of warm straw, oiled leather, and animals. There is very little manure smell, and the floor is amazingly clean. Whoever manages the stables is clearly a stickler for cleanliness. The back half of the barn has six stalls for stabling horses, mules, draft animals, or donkeys. There are barn doors on the north, south, and west sides of the building. Grand murals of rolling hills, forested valleys, and serpentine rivers cover every wall of the tavern’s main room. The large room is lit by paper-paned wooden lanterns hanging at intervals from the rafters, and is warmed by a huge stone fireplace that takes up most of the wall on the west side of the room. Long tables lined with benches fill the center of the room, while booths and smaller tables line the walls. The east wall is dominated by a long bar lined with stools. Mugs, bottles, and tankards are stacked high on a shelf behind the bar. There is a small stage in the northeast corner with a door beside it, and a seat in the southeast corner. You also spot a pair of potted olive trees; one is by the entrance, and another is next to the chair. In addition to the door by the stage, there is the main entrance, a door behind the bar, and a fourth door on the south wall near the fire. The fireplace is built from local fieldstone, and the hearth is a single slab of slate from the quarries northeast of town. It’s nearly fifteen feet from end to end and five feet deep. The bar doesn’t have any flourishes or fancy carvings. It is simple but solidly built. The most distinctive feature is the bar surface, which is made from a single, massive board. The board is oak heartwood, and has a beautiful grain, and shows hardly any signs of wear. The tavern has four types of seating. The first are the long tables which are always used for communal seating. When you sit at the long table, you are indicating that you’re there to socialize and open to conversation. The second are the round tables. These aren’t necessarily communal seating, but if the long tables are full, one is expected to share the table with others. Third are the high stools along the bar. The bar is the preferred choice for a person that is alone, but who doesn’t really want to socialize with the rest of the crowd. Finally there are the booths. By unspoken agreement, the booths are a place where a person can talk privately. If a group of patrons select a booth, the rest of the crowd generally leaves them alone. The high backs and dim lighting make them perfect if you don’t want everyone else to overhear your conversation. On the outside of each door is painted some kind of animal; bear, wolf, stag, or coyote. Inside, you find a clean, private room. There is a bed in one corner with a small table next to it, a desk and chair, and a chest with a lock. The room has a glass window, and you can see from the hinges that it opens to let in fresh air. The windows facing west however are protected by iron bars. Each bed has a straw-stuffed mattress and a down pillow. It has linen sheets and wool blankets. There is a chamber pot under each bed, plus a portable coal stove that can be pulled out and stoked on particularly cold nights. All the private rooms have good wooden doors that lock. The animal painted on the door corresponds to a matching painted animal on the wood placard attached to the guest’s key. The room has an oil lamp that is kept full. This large room has three sets of bunk beds and a small table with a few chairs around it. These rooms are rented by the bed or by the room and sleeps up to 6 people. Bunk rooms offer more privacy than the common room, but a guest might still end up bunking with a stranger. Like all the other rooms, the bunk rooms are neat and clean. There are chamber pots under the beds, and a coal stove for especially cold nights. The bunks are rope beds with straw mattresses and down pillows, but neither the pillow nor the mattress is stuffed quite as well as in the private room. Beds have linen sheets and wool blankets. The room has a few oil lamps, but guests in bunk rooms are expected to take them down to the bar if they need them refilled. A pile of bedrolls lay in one corner of this large, open room, and a few bedrolls are unrolled and lying on the floor. The room is relatively clean, but it smells of sweat and other body odors. This large open space is a cheap, communal sleeping area for anyone that can’t afford one of the bunks or private rooms. A small, stone building that appears to be quite old sits behind the barn. The areas in between the buildings are fenced in, creating an enclosed yard. There is a rabbit hutch built against the wall of the barn and next to it is a chicken coop. Nestled between the barn and the stone building is a small pig sty, and in the center of the yard is a stone well. 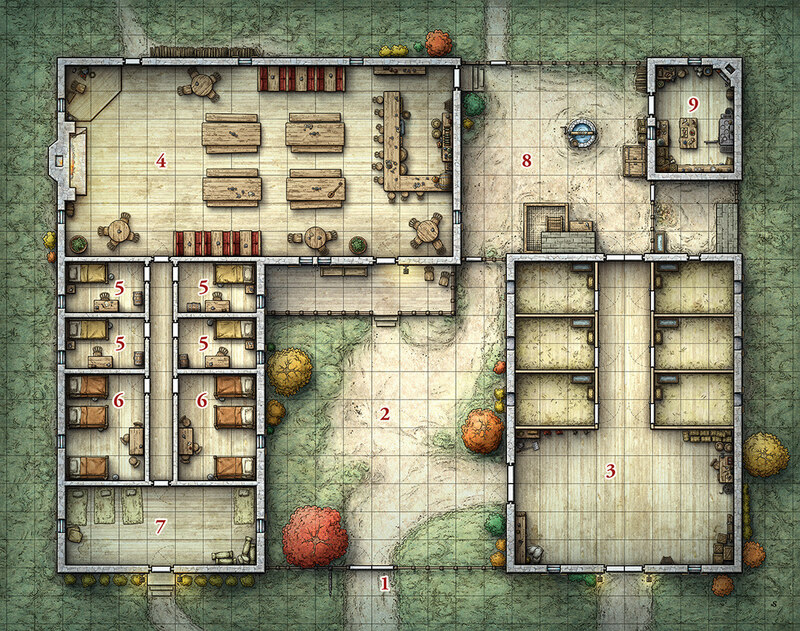 The stone building is the tavern’s kitchen. It has a slate roof, a chimney in the northeast corner, and a second chimney on the east wall. It has a cellar underneath that is accessed through a pair of cellar doors on the west side of the building. The smell of fresh bread, roasted meat, and onions fills the space inside the stone building. In the northeast corner is a small bread oven, and on the east wall is a stove. Every other exposed wall is covered by shelves, tables, and piles of crates and barrels. The center of the room is dominated by a table, and strings of onions, sides of dried meat, pots, pans, and utensils hang from the ceiling. Dannru: Innkeeper/Owner, human, late 20s, bald dome on his head from premature balding, crown of light brown hair. Wears a stained leather apron over a simple cotton tunic. Dela: Innkeepers wife, human, short white hair and gray eyes. Late 20s. Mia: Dannru and Dela’s 8 year old daughter who recently went missing. Harmin: Bartender, older dwarf with a mostly grey beard with streaks of red. Wears a leather apron that covers most of his front. Has a large round nobby nose, and has large calloused hands. Edwaild: A retired soldier in his late 30s. Edwaild is heavyset, with silver hair and sharp brown eyes. He wears chain mail and wields a long sword.